Venice, the fearless city built on water, is a magical kind of destination. Its picturesque alleys and canals will pull you back in time while its lively culture captivates your senses. Every visit, we see Venice in a new light. We discover something different, something unseen and appreciate this city more each time. This trip, we steered clear of the hoards of tourists constantly bustling around and tried to find a piece of old historic Venice. A place authentically real. So what better place to start our trip than inside a 17th century palace, refreshed with all it’s original grandeur? The Ca’ Sagredo Hotel was once a palace, built by the Morosini family in the 15th century. The Sagredos, an eminent family of Venetian nobility, bought the palace in the middle of the 17th century.. Throughout history, the building and its décor have been preserved and enhanced to become a sort of modern day museum. The hotel still maintains a prominent air of royalty, which fills the grandiose halls and staircases with powerful timelessness. You might have great wi-fi and air conditioning as you walk around, but the frescoed walls and grand staircase tell a different story. Because Venice doesn’t have roads or cars, the transportation is reliant upon water taxis or the Vaporetto—Venice’s alternative to a subway but with boats instead of trains. We floated down the sparkling waters of the Grand Canal and arrived at the private dock of Ca’ Sagredo without any difficulty. The textured, pink-washed walls of the hotel stood before us modestly, and thus began our magical stay at Ca’ Sagredo. When you walk into Ca’ Sagredo, it’s like you’re stepping into an 18th century Venetian masterpiece. It’s easy to imagine the grand parties that once took place here. Artists, poets, actors, and nobility in their lavish Venetian costumes wandering through the halls…if only these walls could talk! Although the building is centuries old, it still maintains a lot of its original features. The common spaces and ballroom are sumptuously decorated with frescoed ceilings and tiled floors. The interior is lit with exquisite Murano chandeliers and accented by masterful sculptures and antique furniture. You will feel like a king or queen ascending the marble staircase that connects the lobby to the upper floors, which is framed by colorful murals and imperial arches. Classical Italian music played softly in the background—the perfect soundtrack for our Venetian fantasy. Although the hotel doesn’t have the usual amenities like a spa and a handful of restaurants, Ca’ Sagredo makes up for it with its abundance of thoughtful spaces. The rooftop terrace shows off the aged architecture that makes up the incredible skyline of Venice. Here you can enjoy a fruit cocktail made with fresh ingredients from the nearby Rialto market and melt into a landscape of total romance. The L’Alcova Restaurant inside Ca’ Sagredo offers outdoor dining space along the canal. It is the most charming spot to indulge in Italian coffee while watching the gondoliers glide by. L’Alcova specializes in traditional Venetian cuisine using the freshest Italian produce sourced from the nearby market. Breakfast at Ca’ Sagredo is served in one of the grand ballrooms, where you have your choice of fruits, cereals, charcuterie and a few hot dishes. Sitting here amongst the chandeliers, centuries-old paintings, and elaborate frescoes is a lovely way to start a day. The rooms at Ca’ Sagredo blend the pleasures of history, art, and hospitality in a manner that makes the hotel feel truly inimitable. The 17th and 18th century art that decorates the rooms continues the mesmerizing spell of timeless Venetian style. Although the atmosphere of the rooms feels like a trip back in time, the amenities are modern and comfortable. We stayed in a suite that overlooked the action of Camp Santo Sophia and part of the Grand Canal. Our suite fit in with the Venetian taste and flaunted period-style furnishings. The rich fabrics kept with the historical legacy of the 15th century palace. Our bedroom was nicely sized and illuminated by the natural light of a huge window styled by thick, golden curtains. Our bedroom was attached to a small living room perfect for morning coffee. 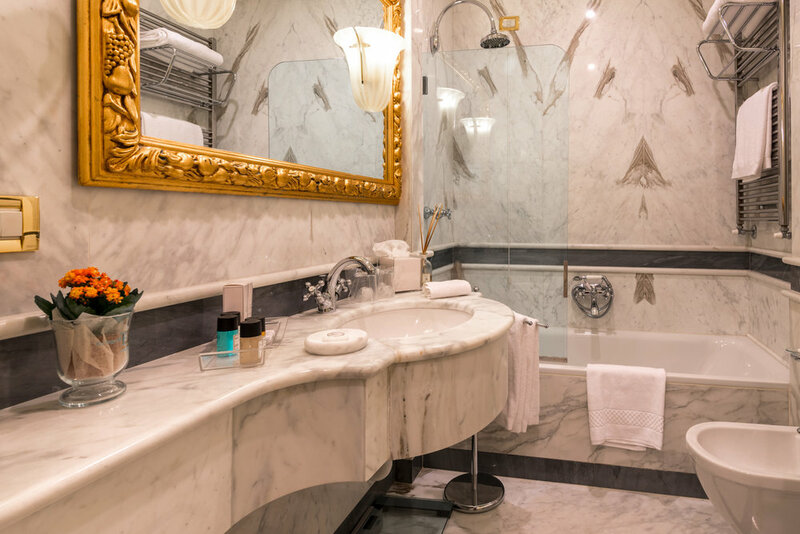 The bathroom was decked with gleaming marble to complete the elegance. Everything about our stay was extremely comfortable, spacious, and royal—we truly felt like guests of a palace. In certain parts of the year, Ca’ Sagredo works with a theatre company to produce Shakespeare’s tragedy, Othello. When they put on the play, each act takes place in a different area of the hotel, bringing to life the surrounding décor and artwork. During our stay, we came across a few cast members rehearsing their lines. The actors went up and down the grand staircase with dramatic animation and passion. Watching them perform before such a historical backdrop was captivating. Next time we will be sure to book our stay during a performance! Ca’ Sagredo is the ideal hotel for those interested in unique history, classic art, and authentic Venetian culture. The hotel is located in a convenient spot of Venice, right across the canal from the Rialto Market. You’ll find a wide variety of restaurants, bars, and cicchetti (the Venetian equivalent to tapas) that will get you into the spirit of Venice. Venice is a walking city full of winding alleyways that beckon your exploration. Don’t be afraid to head out, minus the map, and mingle with the magic of Venice.